In this post, you’ll find tips for choosing the best tomato plants, an explanation of how tomatoes are classified, and a list of our top performing varieties. We get asked this question all the time. So I thought I’d put together this post to explain how we choose the varieties that we plant and also give you a list of our best tomato plants that we’ve had the most success growing. 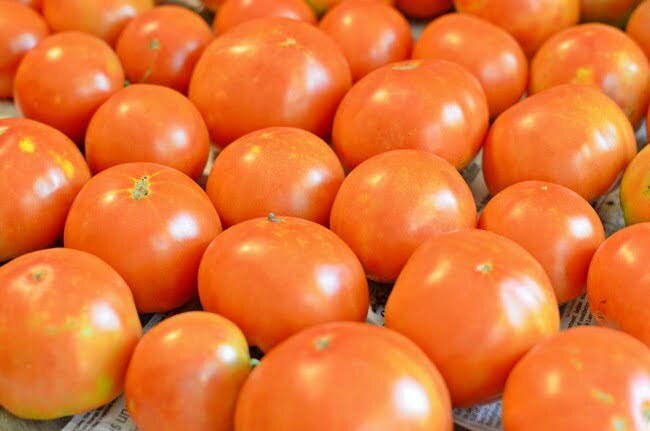 Look at those delicious, ripe tomatoes! There is nothing like the taste of a sun-ripened, homegrown tomato. I honestly feel sorry for people who have never tasted one because they just don’t know what they’re missing. The ones found in a grocery store just don’t even come close. But you already know that, right? 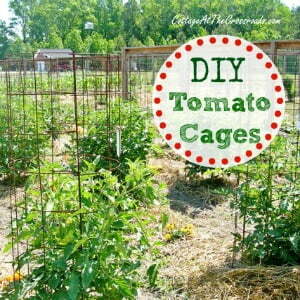 Otherwise, you wouldn’t be reading an article about selecting the best tomato plants to grow! First and foremost, where you live determines which tomato varieties will perform best. We live in the Pee Dee region of South Carolina where it is hot and humid during the summer. There are many tomato varieties that cannot tolerate either of those growing conditions. We also have a long growing season as we can plant around the first of April and continue to harvest until the end of October. We use transplants that have been grown in a local nursery by people who are knowledgeable about the varieties that grow well in our region. My best tip is to solicit advice from your local garden center or farm supply store. Tomatoes are classified according to their use. Are you looking for slicing tomatoes for making sandwiches? If so, those varieties often are labeled as beefsteak type tomatoes. They produce large, heavy fruit and need more heat during a longer growing season. Do you plan to make tomato sauce? Those kinds of tomatoes are called paste or Roma tomatoes. Or, do you primarily want to use tomatoes in salads? 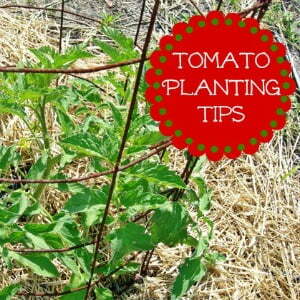 Look for varieties that produce smaller fruit within a shorter growing season and are labeled cherry or salad tomatoes. We grow mostly beefsteak, salad, and some cherry tomatoes. Although we have grown paste tomatoes, I prefer using other tomatoes in making my homemade canned spaghetti sauce. After deciding how you will use your tomatoes, then you need to think about how much space you have to grow your tomatoes. It is often hard to imagine tiny tomato plants growing into the massive plants that you see in the above photo! But many of them do! Tomatoes are classified according to their growth habit. There are two basic categories: determinate or indeterminate. 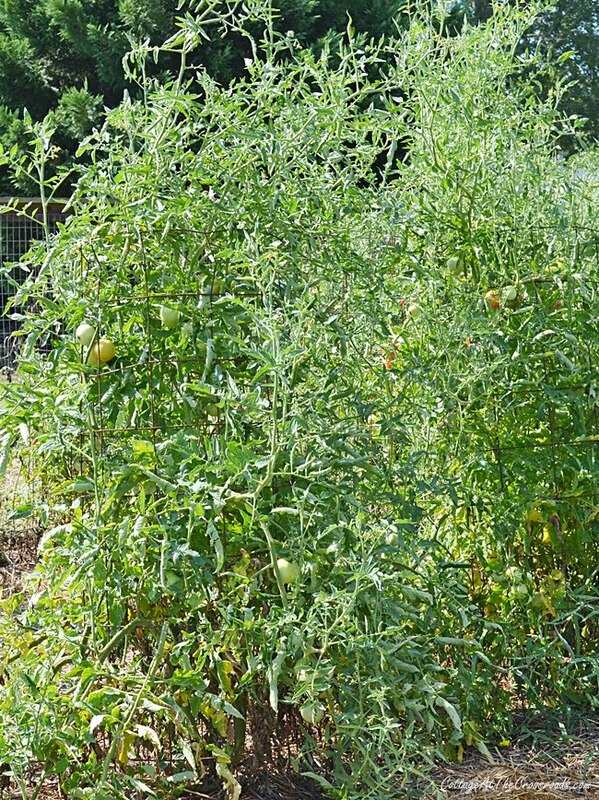 Determinate tomatoes grow to be about 3-4 feet tall and they set their fruit about the same time. Once they bear their fruit over a 1-2 week period, they are done. Sometimes they are called bush tomatoes and you can even find compact, dwarf varieties that are suitable for planting in containers. Most modern hybrids are determinate tomatoes. 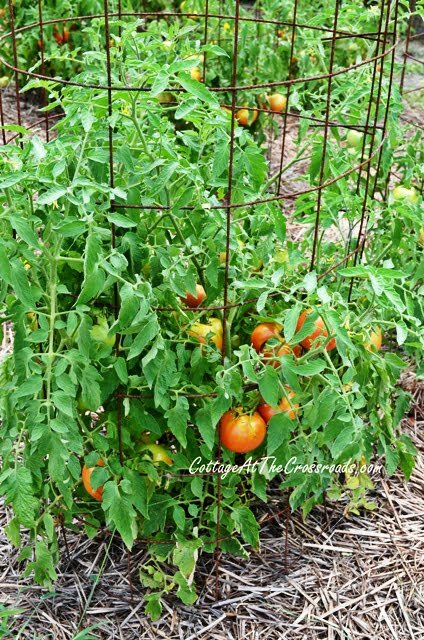 If you have a short growing season, determinate tomatoes are the best choice as they ripen early. 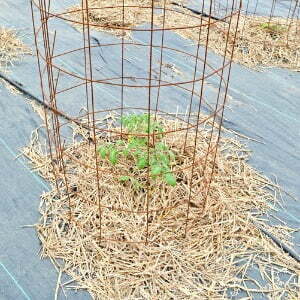 Indeterminate tomatoes are large vining plants that need a lot of space. They can grow as tall as 7-8 feet and need sturdy support. We grow ours in Leo’s DIY Tomato Cages that he built a few years ago. All cherry tomatoes and heirloom tomatoes are indeterminates, and I have a handy way of remembering which is which. INdeterminates need to go IN a large cage! If you are looking to grow the best tasting tomatoes, then there is no doubt that you need to grow some heirloom varieties. Heirloom tomatoes have been cultivated for generations with the seeds saved and passed on from year to year. They are selected for flavor above all else and because disease resistance has not been bred into them, they can be somewhat harder to grow. Many of them, however, have adapted to local conditions and do well in the home garden. Hybrid tomatoes are the result of crossing two or more varieties of tomato plants to obtain the best traits of the parent plants with disease resistance being the main goal. When we first started our vegetable garden, we were unaware of the many soil-borne and insect spreading diseases that can attack your tomatoes! Because of their disease resistance, they are usually easier to grow. A question that we are often asked is if hybrid tomatoes are genetically modified. GMO refers to how unrelated plant material is inserted into the genes of another plant through gene splicing, and these varieties are usually only available to commercial farmers. You can rest assured that the modern hybrids that are sold for home gardeners are not GMOs. But it also gives you a good reason to grow your own tomatoes, right? After growing tomatoes for almost 10 years, we have found the following varieties to be the best performing plants for our area. Celebrity This is the main variety that we plant. It is a determinate hybrid that produces red, round, and great tasting fruits that weight about 1/2 pound each. They are bred for growing in home gardens with dependable performance. We use these for salads, sandwiches, and canning. Cherokee Purple In our opinion, these heirloom tomatoes have the best flavor of all. They are actually purple and have a rich, complex flavor that is unmatched. They are indeterminates and continue to grow and produce all summer long. Sometimes the fruit is irregularly shaped but don’t let that deter you. There is nothing better than a good ole tomato sandwich made with this variety. Sweet 100s This is a super sweet, thin skinned cherry tomato variety that matures early and continues to produce until frost. It is an indeterminate and needs plenty of space and support. Don’t plant too many of these plants or you’ll be left wondering what to do with your harvest. Better Boy This is a determinate, hybrid, beefsteak tomato variety that has been around for over 50 years! I remember that my parents planted this variety in their garden so I grow them too for their performance and flavor. A slice of a Better Boy on a grilled hamburger is a classic! Lemon Boy I had never tasted a yellow tomato until we started growing them, but there will always be room in our garden for these low acid indeterminate hybrids. 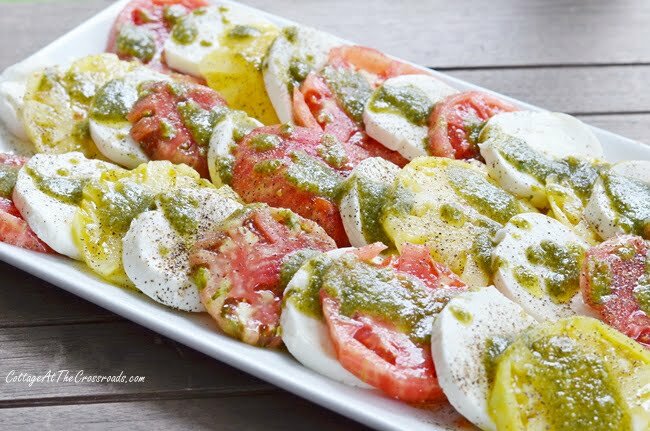 I love to use them in making a caprese salad for their unexpected color and flavor. Green Zebra I usually only plant one of these indeterminate plants for its fun color and tangy taste. They are not really a true heirloom nor a true hybrid but is a result of 4 heirlooms that were bred together. I use them along with the Lemon Boys in making a caprese salad. Yellow Pear This indeterminate heirloom produces small pear-shaped fruits that are pretty in a salad. You really only need to plant one of these because they are very productive. Mortgage Lifter We don’t plant these every year but I’m pretty sure that I’m holding one in the photo below. This indeterminate heirloom produces huge fruits that can weigh up to 4 pounds each! 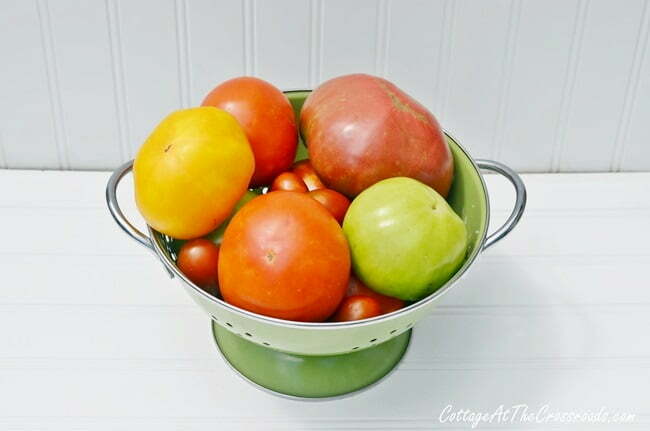 At today’s price per pound for tomatoes, you could pay off your mortgage quickly! That’s our list of the best tomato plants that we’ve had great luck with in our garden here in South Carolina. But keep in mind that the varieties above have adapted to our heat and humidity and may not do well in your area. My best advice is to consult with local growers and to plant more than one variety to ensure a good crop. I can’t wait to get some tomatoes in the ground knowing I’ll be tasting a delicious caprese salad within a few months. Can you? Looking for more tomato growing advice? Great information Jane. I have missed some of your posts lately. I don’t know why but thank you for sharing. Have you changed your email address? If so, you’ll need to resubscribe. Thank you so much for listing the varieties that grow well here in Horry/Pee Dee area. Haven’t had much luck growing tomatoes here (relocated from Southern California where we used to have bumper tomato crops) Definitely will try the Celebrity and Sweet 100’s. Jane, your article has me ready for a BLT!! We plant “Marion” tomatoes. Great for sandwiches, slicing, and canning. They have a stronger tomato taste than others we have tried. Sometimes they can be hard to find, but have gotten them from Lowe’s a few times. We usually plant around 75 (we share)!! Thank you for telling me about your experience with the Marion variety. I will try a few of those this year. I always like to try a few new varieties each year. Keeps gardening interesting! Having tomatoes during the summer makes up for the heat and humidity that we endure, right? Thanks for the good description of the tomatoes….my space is very limited so thi was a tremendous help. I enjoy your info and comments very much. Thanks and keep up the good work…by way hope you do a tour of the Charleston house this year. I’m glad to know the info was helpful, Virginia, and I wish you good luck with your tomato growing this year. Great info! Tomatoes brought into the kitchen from a home garden on a sunny day are truly a treat even royalty can’t top! Pass the bread and mayonnaise, please! I agree with you, Jo! 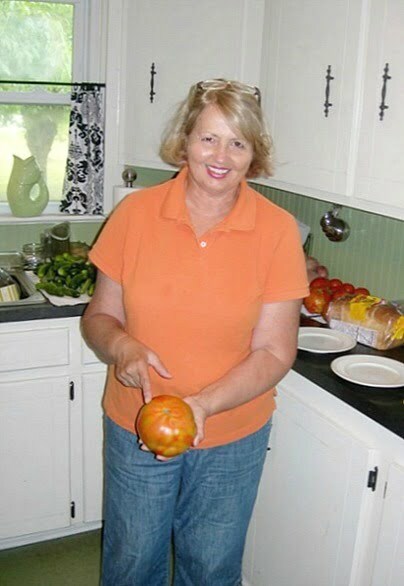 Nothing finer than a ‘mater sandwich made with a sun warmed tomato fresh off the vine! Diana, yes we do rotate the tomatoes and we also try to put them in two different growing areas of our garden. For some reason, we did plant some in the same place and they did not do as well. Needless to say, they will not be planted there this year!